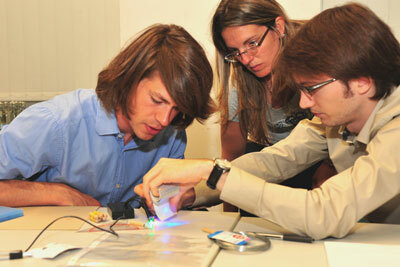 (Nanowerk News) Carl Zeiss is hosting euspen Challenge 2010 which is taking place in Jena from 1 – 3 July. The international competition for students of the engineering sciences in the fields of precision engineering, microtechnology and nanotechnology is organized by the European Society for Precision Engineering and Nanotechnology (euspen) and is taking place for the first time this year. Carl Zeiss has been a member of euspen since 2006. "It is a special honor for us to host the first international competition," says Dr. Klaus-Friedrich Beckstette, Senior Director of the Technology Center at Carl Zeiss Jena GmbH and Member of the euspen Council which supported the organization of the event in Jena. For the international final of the 2010 euspen Challenge, Florian Böhmerman from Germany, Stefania Gasparin from Denmark und Maximilien Dany From the UK (from the left) worked at Carl Zeiss in Jena on an assignment related to optics. In the international final the 21 winners of the national preliminaries from Germany, Belgium, Denmark, the UK, the Netherlands, Spain and Switzerland will compete in mixed teams of three members each. They will work on an assignment related to optics and then present it to a jury. The winners will be selected by the jury, including representatives from Carl Zeiss, Jenoptik and Heidenhain subsidiary NUMERIK JENA, which have also provided the awards for the best solutions. Carl Zeiss is donating the first prize – three pairs of binoculars of the type Victory 10 x 42 T* FL, each with a value of 1,300 euros. The award presentation will take place in the Hotel Schwarzer Bär in Jena from 8 p.m. on 3 July. Apart from the competition itself, company visits, cultural events, an evening cook-in and a meeting with representatives from selected firms in the industry are also featured on the three-day agenda.